You’ve turned on your autoresponder; it’s officially time to kick back. After all, summer vacation is one of the best times to be refreshed and renewed. It’s no surprise that we want an adventure on our summer break and that often comes in the form of reading a good book. Here are some intriguing book titles for summer 2018: “A Long Way from Home” by Peter Carey, “How to Stop Time” by Matt Haig, and “Less” by Andrew Sean Greer. While it’s pretty clear that a lot of us want to disconnect from work (and who could blame us), summer is also a great time to better ourselves. Similarly, there are other books we would love to read, so let us know what you’re reading this summer! Did you know you can stay connected to us when you’re traveling? We live stream our services every Sunday at 10:45 am and you can also listen or watch the service replays weekly on Mondays or Tuesdays. It is important that we remember homelessness and hunger impacts our community all year long, not just during the holidays. 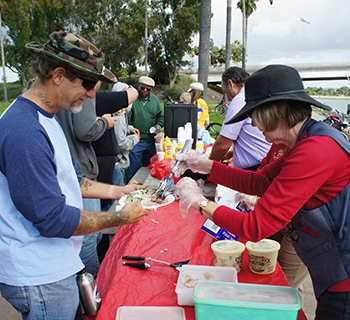 The Homeless Ministry continues to feed the homeless men and women lunch at Mission Bay Monday through Friday alongside the Salvation Army. The words of gratitude heard from those served is what inspires the ministry team to continue. The Homeless Outreach Ministry not only feed men and women five days a week, but they also provide bus passes, gift cards, and a Christmas luncheon. Words of gratitude heard from those served is what inspires the ministry team to continue.